There are few things that my beloved Boone, NC is lacking in. Where to eat is NOT one of them. I can’t say that was the case back (whenever it was) that I attended ASU. Of course, maybe I just didn’t appreciate the offerings back then. No, truly, things have definitely made a turn for the better, culinary speaking, in Boone. And if what you are seeking is a healthy, wholesome, sustainable meal, look no further than Melanie’s. 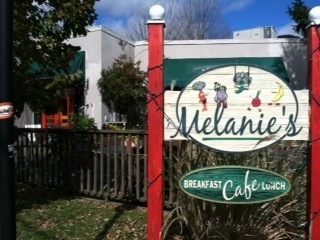 Melanie’s is very inviting on the exterior and kind of old school and organic on the inside. No muss, no fuss. Just a delightful brunch and wonderful lunch options that will have you leaving with practically no guilt, gut wise. On busy weekends, you may wait for a table on the patio as it sits in beautiful downtown Boone with a view of destinations like Mast General Store and Farmer’s Hardware. The menu is full of breakfast yumminess like omelettes, benedicts, and quiche but some come with tempeh and tofu. The pancakes are whole grain, waffles are Belgian (one of the few indulgent items …well, plus the biscuits) and the fruit is seasonal and organic. You can get oatmeal too. Plenty of choices for your first meal needs. Lunch brings around panini’s, wraps, sandwiches and a awesome selection of burgers. On the foodies’ recent trip, Mister chose a Butter Burger with a spicy southwestern butter, topped with sprouts and lettuce. It was served with a side of their home fries. 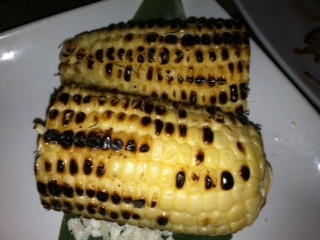 It was juicy, smokey, with just the right kick of heat. I made a huge departure and got a veggie burger. Melanie’s is made from scratch using potatoes, carrots, onions, squash, zucchini, flax seeds, bread crumbs. It’s topped with lettuce, tomato, and sprouts with a choice of aioli and cheese. The veggie burger was delicious, nutty and filling. One step into Melanie’s and you know this is probably a signature item. The selection of paninis will have you in a decision dilemna. As will their sides as so many are appealing. I must suggest the Jamaican slaw though. Yummy! And breads are homemade. So if you are visiting the High Country and you need a place for breakfast or lunch, you will be pleased with your healthy trip to Melanie’s…that is, if you choose to eat healthy there. If you want to be bad, they can accommodate. You can have a waffle with Canadian bacon or Soysage. I doubt you’ll leave like you’ve pigged out. And that’s a very good thing! 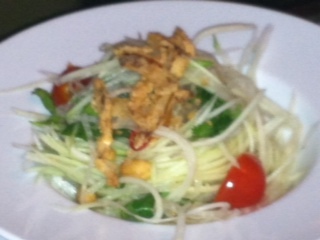 This entry was posted in Beyond the Triad and tagged Breakfast, healthy, Lunch on November 21, 2012 by triadfoodies. For the first time, the foodies made an “official” visit to High Point….to re-visit a place we enjoyed a few years ago and decided that we had to share it with all the other foodies in the world. Full Kee is not just Chinese, it’s GOURMET Chinese and it puts to shame just about any other Chinese restaurant, take-out or otherwise. What happened on this visit, was nothing short of a November miracle. My. Kidlets. Ate! 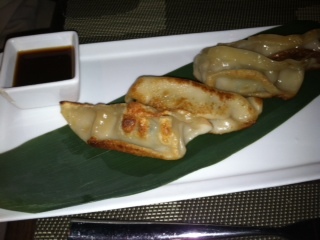 They ate the Pan Fried Pork Dumplings and some of the Shanghai Spring Roll. Who wouldn’t, it looks so appetizing. Full Kee has many of the Chinese dishes you’ve come to love…Sesame Chicken, Moo Shu Chicken, Beef with Broccoli, Mongolian Beef, etc. But I implore you to try some of Chef George Yu’s specialties like the Crispy Beef and especially, ESPECIALLY the Full Kee Shrimp. It’s a combination of Philomena Shrimp, jumbo shrimp in a creamy white sauce (think that somewhat sweet seafood sauce you might like with your Hibachi) and Walnut Shrimp, jumbo shrimp in a sweet tomato, walnut sauce. It’s served with broccoli and your choice of rice. Fantastic and beautiful. We also decided to get something a bit more traditional, something we love…General Tao’s Chicken. Sweet and a touch spicy. It was perfect. Now the kidlets (not ready to call them lil foodies, yet) saved room for their delicious Chicken Fried Rice. It came in this beautiful metal wok with sautéed onions, shredded chicken and some veggies. There was pretty much nothing left after we all dug in. They also helped themselves to some of our General Tao’s (they call it honey chicken). Full Kee is scrumptious. 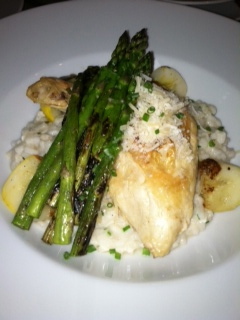 There are so many dishes to choose from, things you may have never seen before all in a more upscale setting. They are open for lunch and dinner Monday through Saturday and dinner only on Sunday. They also cater if you are so inclined. I can’t wait to go back and the good news is, I know my kids will eat. And that’s saying something. This entry was posted in You Should Eat Here! on November 15, 2012 by triadfoodies. Sometimes, the food you want is a hot, fresh PIZZA. Nothing is more convenient and few other foods hit the spot. The kind from a real Italian restaurant. And sometimes, when you get to the place that makes hot, fresh PIZZA, you say to yourself…”Well, now I can’t leave here without having THAT (something other than pizza).” Such is the case with Amalfi’s in Kernersville. It makes me glad I have kidlets who don’t eat anything but bread, grilled cheese or hot, fresh pizza when we go out to eat (because Mama Foodie will get some of their pizza). Amalfi’s is a little local favorite in our in-between town. Great for some authentic, yummy Italian and you don’t have to venture to the “big city” to get it. The service is always amazing, prices are reasonable, pasta is creative and just right for what you are craving, and the specials are inventive and fresh. You can’t go wrong with my favorite Smoked Chicken Ravioli or Mister’s fave, Chicken Parmigiana. If you love spicy, the Shrimp Fra Diavlo provides just the right amount of devilish heat, along with large, succulent shrimp and clams over linguini. It’s one of my favorites at Amalfi’s as well. All of the classical and house specialties will leave you happy and full (and probably with a takeout box) and you rarely find anything over $16, most dinner entree are around $12. If you dig Italian sammies, there’s a large selection, along with terrific, wallet pleasing combos–some specials start at $4.99. And let’s not forget Stromboli and calzones. But what brought us to Amalfi’s in the first place, was hot, fresh PIZZA! And Amalfi’s pizza is fantastic. You can get it round and thin (NY Style) or thick and square, Sicilian. Or try a specialty pizza like Margherita or Chicken Caprese or a White Pizza. 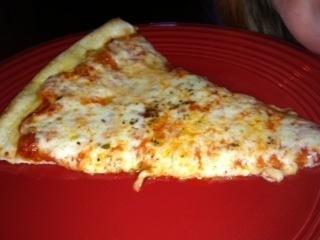 We were having camera troubles so here’s a pic of a slice of a traditional cheese pizza. Nothing fussy, and my favorite kind (even though I’m a foodie). I can’t tell you how many times we’ve ordered it, picked it up, brought it home and classed it up with a glass of red wine. Amafi’s is Italian owned and operated by Agostino & Maria Errichiello- part of the same family who owns Elizabeth’s Pizza of Greensboro & Oak Ridge. They’ve been pleasing Kernersville with that awesome pasta and pizza since 1997. 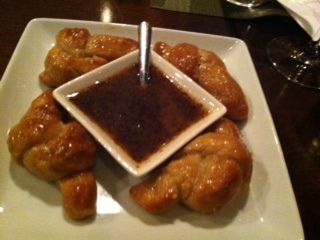 Chef Agostino treated us to a small “dolci” of Italian Donutz with Chocolate. Little balls of dough fried crisp, rolled in sugar and drizzled with chocolate. It tasted like a carnival and the kidlets agreed! So if you are ever passing through Kvegas and you just have to have some pizza but you don’t want delivery or deFrozen, swing by Amalfi’s. Have a glass of Chianti, or a coke, and a slice and pick up some milk and bread at the store next door. You’ve saved time, money and you’ll probably have leftover pasta or PIZZA (perfect for tomorrow’s breakfast). This entry was posted in You Should Eat Here! and tagged casual, Dinner, family friendly, Fun with friends, Kernersville on November 9, 2012 by triadfoodies. The foodies hit the road to the Triangle this weekend to meet with dear friends who love food as much as we do. And they were game enough to agree to take on a most adventurous way to eat…Global Street Food…at Buku. Buku (my screen won’t let me make it all cute with the dot in between bu and ku) uses the inspiration of pushcart vendors around the globe and brings it all under one roof. You can travel the world sitting at your table in a very cool, downtown setting with a great bar, decor and ambiance. 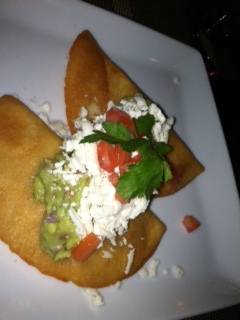 It’s an interesting way to eat…some appetizers and small plates that are great for individuals and some are sharable. Love to eat this way! Ask your server to be your tour guide. Entrees are good portions and also quite sharable. There were 6 adults at our table and 4 children and we tried A LOT of things so I think this time around it might be best to just throw the pics in and briefly describe all of them. When we say Global food, we mean it. It’s everything from Naan bread and yogurt spread and Pita and hummus to lamb meatballs, pierogies, pretzels, empanadas and full spread of sushi, and also entrees. We tried a little bit of everything. Let’s go global, shall we? All delicious first courses. See, we’re already expanding our horizons. Ready for more? Let’s talk about a few of these. 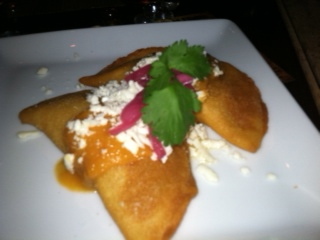 My favorites were the Empanadas Picantes, which had a little more kick than the original. But I also loved my Tuna Poke. 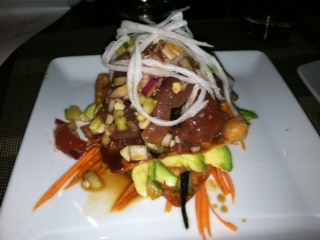 It was like a light, delicious tuna tarter stacked with wontons and veggies. 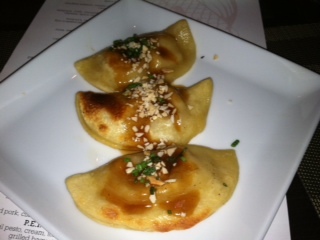 The pierogis were also delicate and wonderful. 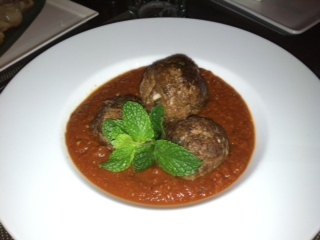 Kefta was spicy with a lingering kick. Be ready for some heat but they were so good. 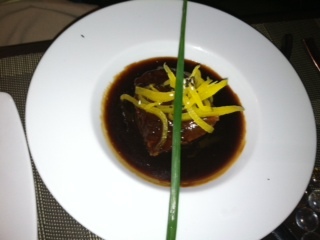 And the sake braised short rib tasted like it should, homey…like it was cooked a long time and got all thick and gravy-like. I didn’t get to try much Naan and Pita. Why? 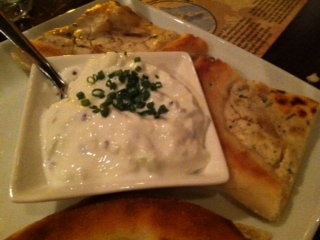 The kids ate it, so it must’ve been good…but the hummus and raita were excellent. Did I mention I LOVE LOVE LOVE to eat like this? Just noshin’! The grilled corn was for the kids so it’s missing it’s pretty toppings, the chicken was beautiful and our friend said he enjoyed it. The Snapper was wonderful, light and cooked Indonesian style with tamarind and Thai seasonings. 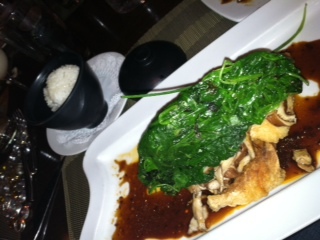 It paired wonderfully with the unfiltered chilled Saki (if you’d like the complete Asian experience). Thank you, Joanne, for the artsy presentation. 🙂 Now for dessert! These pictures just make me happy. 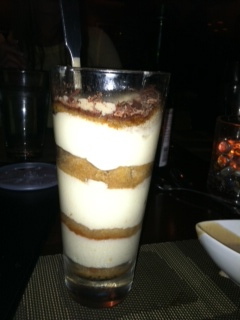 We ordered the Tiramisu, which is served “en vace” with an espresso anglaise. And my friends ordered the creme brûlée. 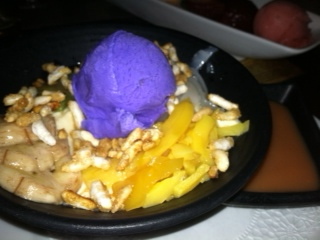 The chef sent us the Halo Halo because…well, just because. And as you can see, it’s so beautiful and it was awesome. That is a purple sweet potato ice cream. It’s a parfait of coconut custard, sweetened plantains, guava sauce, coconut meat…heaven I tell you and I could taste “the islands”. They also brought over their chef’s selections of 6 sorbets which included a variety of sweet and citrusy sorbets, one of which was grapefruit and another cinnamon. 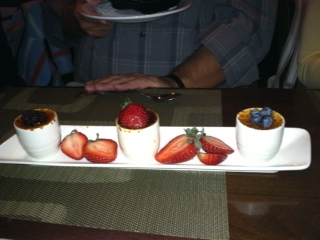 A few at my table determined the sorbets were their favorite of the 3 desserts. 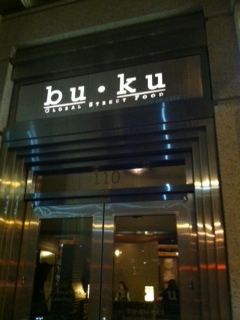 Buku is very popular and has been voted one of Raleigh’s best. It’s easy to get carried away and find sticker shock at the end of the meal because you find yourself ordering 2 of something for the table but you can get out of there without breaking the bank because many of the options are very affordable. The service and management are top notch. 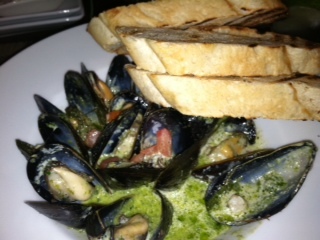 The ingredients are fresh, sustainable and they go great with a selection of hand-crafted beer, wine and libations. The regular menu stays pretty much unchanged but they do offer some cool specials like Balsamic lamb shank and Pork Belly Bacon Cheese Burger, oh my! If you are ever in the Capital City, it’s definitely worth a visit to this global showcase of goodies. 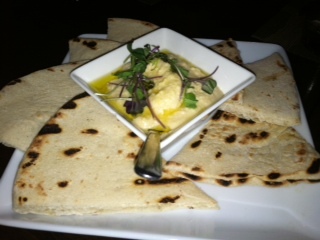 This entry was posted in Beyond the Triad, You Should Eat Here! and tagged casual, Date Night, Fun with friends on November 5, 2012 by triadfoodies.